Artist rendering of Margaritaville Beach Resort coming to Panama City Beach. Margaritaville Holdings and Premier Development Group announced Wednesday the two companies had reached a deal to develop a new destination resort on Florida’s Emerald Coast. The new Margaritaville Beach Resort will be located on more than 13 acres in Panama City Beach and is scheduled to feature a full-service hotel, amenity park, function space, signature Margaritaville food and beverage concepts, retail, residential properties for sale and more. The resort is expected to begin a phased opening in Spring 2021. 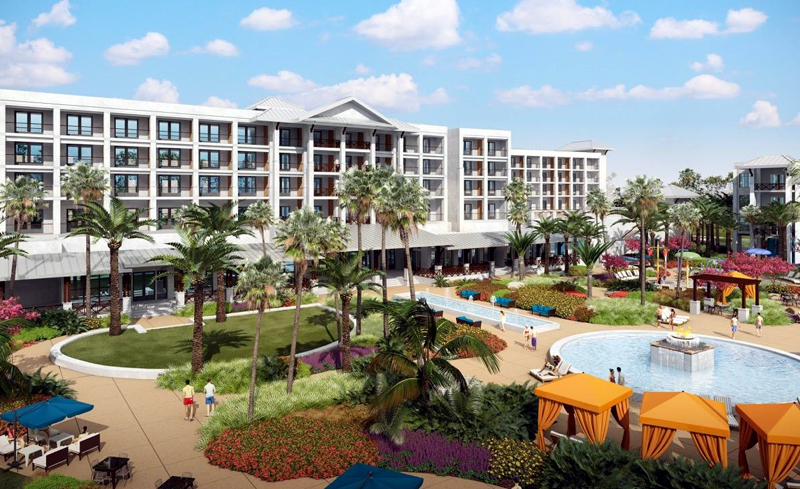 The Panama City Beach resort will feature Margaritaville’s signature design throughout, and guestrooms on the property will offer scenic views and flexible sleeping options, perfect for couples and families. The two-acre amenity park to be built on the property will feature multiple pools, private cabanas, a lazy river, water slides, and a kid’s splash play area. Additional details and timing for the development will be announced in the coming months.